This article is about the course in Super Mario World. For the secret course in Super Mario 64, see Vanish Cap Under the Moat. The Blue Switch Palace is the last of the four Switch Palaces in Super Mario World. It is found in the Forest of Illusion behind the water level, Forest of Illusion 2, the level it is unlocked in. Like all the other previous switch palaces, the Blue Switch Palace cannot be replayed after its completion. The palace consists of two rooms, which the player has 200 seconds on the Timer to complete. The first room contains a blue P Switch, a Gray P Switch, and a line of Empty Blocks with several Spinies walking across the top. The trick is to collect a handful of coins near the edge of the bottom row first before activating any of the Switch Blocks. Once that is finished, the player can hit the P Switch to make the top row become coins and the bottom to solid brick. The player should immediately hit the Gray P Switch, turning the Spinies into Gray Coins. 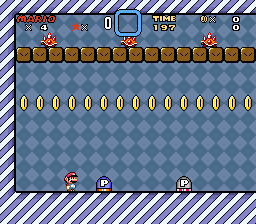 Then the player should quickly jump onto the solid bottom row and collect as many top-row coins as possible. If all the Gray Coins are collected, the player gets an extra life. Once the Switch Blocks wear off, the player can freely collect the bottom row before continuing to the next room. The player is not forced to hit either Switch Block to progress through the level, however. The second room is empty except for the blue ! Switch, which can be activated by jumping on top of it. Once the blue ! switch is hit, all the blue Dotted Line Blocks will become blue ! Blocks. The blue ! Blocks help the player progress through the levels by filling in gaps and allowing some secret exits to be reached. Blue ! Blocks only appear in 13 levels after that. This page was last edited on November 16, 2018, at 21:49.